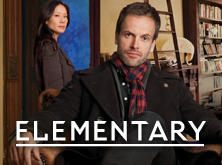 Tonight ushers in the premiere of CBS’s Elementary, the newest rehashing of the Sherlock Holmes story, set in a contemporary New York. It looks as if, in some circles at least, its promising buzz has turned into less-than-enthusiastic reviews. But I am going to watch anyway, for Jonny Lee Miller plays the iconic character. You see, with him returning to the American tube, this means that you can see four of the six members of the principal cast of Trainspotting (Danny Boyle, 1996) on TV every week. You might recall that besides being one of my very favorite films, Trainspotting represents a watershed moment in the history of my cinephilia. In addition to Miller’s (Sick Boy) starring role on Elementary, three other Trainspotters keep busy as parts of big TV casts. Robert “Bobby” Carlyle (Begbie) is on the audience favorite Once Upon a Time (2011-present), playing a certain Mr. Gold, a creep whose storybook world double is Rumpelstiltskin. I only ever watched the pilot that aired last year. I watched, of course, because he is in it, but sadly it was not my cup of tea. Since 2008 (or the fifth season), Kevin McKidd (Tommy) has appeared on the same network, ABC, as Dr. Owen Hunt, Iraq War veteran/PTSD sufferer/Dr. Christina Yang husband-turned-adulterer in the commercial juggernaut that is Grey’s Anatomy (2005-present), which is entering its ninth—and hopefully last—season tonight. Finally, we have Kelly Macdonald (Diane). If there is a leading lady on HBO’s Boardwalk Empire (2010-present), then it would have to be her: she plays Margaret Shroeder, an Irish immigrant in 1920 Atlantic City who falls under the spell of the county treasurer/bootlegging gangster Enoch “Nucky” Thompson. The third season started a little more than two weeks ago with them, having gotten married to protect his investments, on the outs. The star of Trainspotting—and the only bonafide “movie star” of the bunch—Ewan McGregor (Renton), was going to be part of an ensemble for HBO: indie auteur Noah Baumbach developed, co-wrote, and directed the pilot adaptation of The Corrections with author Jonathan Franzen’s full participation. Then in May, the cable channel pulled the plug on the production, for whatever reason. I was really looking forward to this, not because I know anything about The Corrections (which for the record, I do not), but because I knew it meant five, yes, FIVE! cast members of Trainspotting were going to be on American TV regularly. Interesting to see how their wildly different career trajectories brought them to the same medium, “across the pond” as it were, but on programs that couldn’t be any less similar. The only cast member never to have secured a regular role on an American TV show is Ewen Bremner (Spud). What hypothetical or existing show can you imagine him having a part on? Although I gave up on it within the first five episodes of its most recent third season, I think I could imagine Ewen on FX’s Justified (2010-present). If you think the waifish Jeremy Davies can play the heir to an Appalachian drug empire with the most nervous energy, I wouldn’t put it past Mr. Bremner to do him one or two better. If he were cast—and I know this is nothing but a pipe dream—then maybe I’d tune into the show again. Even with Timothy Olyphant’s central performance, I couldn’t get interested in Justified, particularly because its Southern California filming locations betrayed its Kentucky setting to such an extent that I didn’t buy any of it. But I digress. By way of conclusion, I think it’s worth noting the fun coincidence that the Oxford English Dictionary‘s “Word of the Day” is “trainspotter.” Not only do I subscribe to this mailing list, I collect the words I like the sound and/or meaning(s) of. Allow me to educate: according to the trusty ol’ OED, the word, a noun and originally and chiefly British, refers to 1) “A person (often a boy) whose hobby is observing trains and recording railway locomotive numbers, sometimes with other details” and 2) “In extended use (freq. depreciative): a person who enthusiastically or obsessively studies the minutiae of any subject; a collector of trivial information.” That’s me! Though the OED gives “trainspotterish” as a related word, it stops short of giving the further association and definition of “trainspotting,” which refers to a heroin addict’s practice of finding a fresh vein into which he or she can inject the drug. (The markings on their arms resemble train tracks.) Yes, this means that the title of the book and movie Trainspotting represents a utilitarian concept, and in much the same way that we say we “geek out” whenever we get really excited about something in pop culture, thereby taking ownership of the image which may make us seem uncool or esoteric to others, I like to call myself a “trainspotter.” I don’t watch trains (but I do whenever I have the chance), and I’m not a heroin addict, but I am a trainspotter—especially when it comes to Trainspotting.